Nearly all of the blockbuster biographies of the Founding Fathers—whether the subject is George Washington, Benjamin Franklin, or John Adams—portray the vast majority of ordinary Americans as mere bystanders. Although the authors of these bestsellers sometimes pause to honor the common soldiers in the Continental Army, most pay little attention to white men who did not enlist—and none at all to African Americans, American Indians, and women of all ranks. Meanwhile a host of other historians have been quietly documenting the many ways in which women, slaves, natives, and small farmers—the 95 percent of Americans who were not members of the founding-era gentry—shaped the independence movement and Revolutionary War and were in turn influenced by both. If ordinary colonists really had been as passive as they appear in the most popular histories of the founding era, the American Revolution would have been a very different thing, and it might not have occurred at all. While everyone knows that Parliamentary “taxation without representation” was one of the principal grievances leading to the American Revolution, we sometimes forget that the British government also mounted other assaults against free colonists’ economic well being. Nearly all of the best-known Founding Fathers—from Thomas Jefferson and George Washington in Virginia to Benjamin Franklin and Robert Morris in Pennsylvania and Henry Knox and Abigail (not John!) Adams in Massachusetts—dreamed of vastly enhancing their wealth by speculating in western land. That meant obtaining large grants directly from the government, essentially for free, and then dividing them into smaller tracts to be sold to actual settlers. But in October 1763, the Privy Council in London took out a map of North America and drew a line along the crest of the Alleghany Mountains. Beyond that line, the ministers declared, no colonist would be permitted to settle. At first George Washington was confident that the Proclamation Line was only a “temporary expedient” that would soon be repealed. But the British government stood by the 1763 decree for the same reason that it had been promulgated in the first place: in order (as Washington put it) “to quiet the minds of the Indians.” It was not sympathy for the American Indians’ plight that had motivated the Privy Council to turn the area west of the Alleghanies into a giant reservation. Nor was it fear, since of course British officials were in no danger. The issue was financial. Earlier in 1763, more than a dozen Native American nations had joined together in a coalition dedicated to preserving their land. The ensuing revolt is popularly known as Pontiac’s Rebellion, though that label understates the range of the insurgency and exaggerates the role of a single Ottawa headman in a movement where leadership was actually quite dispersed. If the Indians of present-day Ohio, Indiana, Illinois, and Michigan had not decided to rebel in 1763, the Privy Council might never have drawn the Proclamation Line, and land speculators like Washington and Jefferson would have had one less reason to rebel against Great Britain. The Declaration of Independence mentions the well-known issue of taxation once—and Indians and their land three times. In 1769, the Virginia House of Burgesses (whose members included Thomas Jefferson and George Washington) unanimously adopted a resolution asking the Privy Council to repeal the Proclamation of 1763. British officials never acted on the request, and one reason was their abiding concern that taking the Indians’ land would provoke renewed hostilities. Lord Hillsborough, George III’s secretary for his American dominions, was determined to keep Britain out of a “general Indian War, the expense whereof will fall on this kingdom.” The imperial government’s ensuing decision to thwart the land-hungry provincials had the ironic effect of paving the way for an even more expensive war against a coalition of colonists. Once the imperial government had announced its intention to clamp down on its North American colonists in the crucial areas of taxation, territory, and trade, the Americans responded with a wide variety of protests. 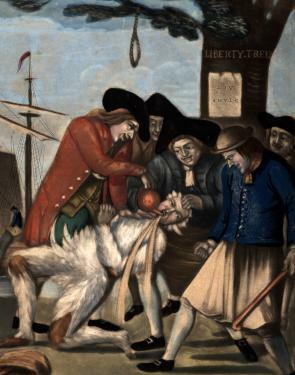 While it was the Franklins, Jeffersons, and Adamses who made the speeches and published the pamphlets, the real work of erecting liberty poles, intimidating colonial officials, tarring and feathering the recalcitrant, taunting British soldiers, and eventually dumping East India Company tea into Boston Harbor fell to ordinary working people. Historians have shown that many of the most famous incidents of the Revolutionary era grew out of deep-seated conflicts that had begun long before the American Revolution formally began. The best-known incident that grew out of this longstanding animosity was the so-called Boston Massacre. The shootings in King Street on the night of March 5, 1770, were a direct outgrowth of a host of petty conflicts, for instance a shouting match between workers at a ropewalk (where ships’ rigging was made) and off-duty—and underpaid—British soldiers competing with them for work. Less dramatic but more important to the eventual success of the American Revolution was a series of boycotts of trade with Britain. The best-known item on the banned list was tea, a beverage much more popular among women than men. Male patriots understood that the boycotts could not succeed without the help of their mothers, daughters, and wives, and the result was an unprecedented and highly successful effort to involve women in politics, initiated as much by the women themselves as by men. The most valuable product that the colonists normally imported from the mother country was cloth, and when the patriots extended their boycott to textiles, they created another opportunity for American women. It was up to them to spin the thread (and in some cases weave the yarn) that would replace the fabric once imported from Britain. By the fall of 1774, most free colonists in British North America were angry at the imperial government, but very few of them wanted to wrench their colonies out of the British Empire. Most just wanted to turn back the clock—back to 1763, before Parliament and the Privy Council launched their irksome initiatives in the areas of taxation, territory, and trade. In 1775 and early 1776, a host of well-known factors—notably the British use of German (“Hessian”) mercenaries, the loss of life at Lexington, Concord, and Bunker Hill, and the publication of Thomas Paine’s Common Sense—conspired to convert free Americans to the cause of independence. South of the line that Charles Mason and Jeremiah Dixon had surveyed in the mid-1760s, many colonists turned against the British for a less well-known reason. They were furious at King George III and his American representatives for forming an alliance with African Americans. When a group of slaves offered to fight alongside the governor in return for their freedom, he turned them away and even threatened to have them beaten if they returned. But the slaves kept coming—rallying to the British standard not only in Virginia but in other British colonies as well. On November 14, 1775, Governor Dunmore’s “Ethiopian Regiment” (as he termed his African American troops) fought a battle against militiamen from Princess Anne County (now Virginia Beach) at Kemp’s Landing near Norfolk, and the black soldiers won. The very next day, November 15, 1775, Dunmore issued an emancipation proclamation that was not too different from the one Abraham Lincoln would publish four score and seven years later. Like Lincoln’s, Dunmore’s proclamation did not free a single slave. He extended his offer only to black Virginians “appertaining to rebels” (Dunmore was himself a large-scale slaveholder) who were “able and willing” to bear arms for their king. Hundreds of slaves joined Dunmore. Within a year, the majority of them would die, primarily from smallpox. But a remnant survived and earned their freedom by serving on the British side throughout the war. In the capstone grievance in the Declaration of Independence, the Continental Congress alleges that George III has “excited domestic insurrection amongst us.” Actually, given Governor Dunmore’s reluctance to act on his initially empty threat to “declare freedom to the slaves,” it is less accurate to say the British initiated their alliance with the slaves than that the slaves incited the British. Here was another case in which seemingly powerless Americans—the black men and women who are routinely excluded from the mammoth biographies that dominate most modern readers’ understanding of the American Revolution—played a crucial role in the conflict. In their own way (and sometimes inadvertently), Native Americans, enslaved blacks, and ordinary whites all helped propel men like Washington, Hamilton, and Hancock down the road to independence. In turn, the ensuing years of political upheaval and war powerfully influenced each of these groups. The Americans who suffered the most were, ironically enough, those who had enjoyed the most success in battle: Indians. Despite their military successes, the American Indians lost out where it mattered most—at the bargaining table in Paris, where of course they were not represented. Although British officials had never purchased or conquered the region between the Ohio and Mississippi Rivers (essentially the modern-day Midwest), they nonetheless ceded this region to their former colonists in the peace treaty signed in Paris in 1783. It would be another decade before the US military conquered the Native American coalition striving to defend this land, but the nullification of the Proclamation of 1763 had begun on July 4, 1776. For African Americans the outcome of the Revolutionary War was more complex. Now that white settlers claimed the Mississippi as their western border, slavery had plenty of room into which to expand—which it did after the invention of the cotton gin, with disastrous results for African Americans. On the other hand, the Revolutionary War permitted thousands of black Americans to claim their freedom. Two northern states, Massachusetts and the new state of Vermont, abolished slavery, and most of the others put it on the road to extinction (although in some cases this would prove to be a very long road). But many more slaves—perhaps 10,000 or more—obtained their freedom by fighting on the British side. After the war, the imperial government settled the bulk of them in Nova Scotia, but continuing discrimination convinced many of these refugees to accept Parliament’s offer to move to the new British colony of Sierra Leone in West Africa. Others made their way to British colonies that remained in the imperial fold or to the home island. Some have even been traced to Australia. Historians of the American Revolution have never been able to reach an agreement about what it did for—or to—free women. Most recently, women’s historians have argued that free women did benefit—at least temporarily. They had been politicized during the 1760s and 1770s, as their domestic activities took on political meaning in the boycotts. Moreover, when men left home to become soldiers and statesmen, women took over their farms and businesses. As they mastered activities such as hiring farm workers and selling crops, their self-confidence grew. More than one wife who corresponded with her absent husband went from describing the family farm as “yours” early in the war to declaring it “ours” (and in some case “mine”) several years later. Yet, if these were gains for women, they were offset by the fact that full citizenship, including suffrage, was denied them. And, in many new states women’s economic situation worsened as inheritance laws changed and put them at a disadvantage. Free white men were the clearest winners of the American Revolution, but for the vast majority of freemen, these gains were modest at best. Historians have shown that, especially after the adoption of the US Constitution in 1789, ordinary farmers actually lost ground in some important areas. For instance, control over the money supply—which determined whether debtors gained at the expense of creditors or vice versa—passed from the colonial assemblies, many of which had been elected annually, to a federal government that often seemed beyond the reach of common plowmen. If the vast majority of Americans of the founding era received few lasting benefits from the American Revolution, the long-term prospect was brighter. Most white men of the founding era chose not to respect women’s, African Americans’, and Indians’ right to life, liberty, and the pursuit of the happiness, and many members of the gentry class suspected that Jefferson’s affirmation that all men are created equal was not even true among white males. And yet the promises of liberty and equality held forth in this document written by a slaveholder have continued to serve as beacons. The 1848 Seneca Falls Declaration of Rights and Sentiments that initiated the women’s rights movement was modeled on the Declaration of Independence, and Frederick Douglass harried the consciences of white Northerners by asking, “What, to the American slave, is your 4th of July?” Indeed the whole subsequent history of the United States can be summed up as a struggle between the ideals of the Declaration of Independence and the circumstances of its creation. Woody Holton is an associate professor at the University of Richmond. His book Unruly Americans and the Origins of the Constitution (2008), which has been published in Arabic as well as English, was a finalist for the George Washington Book Prize and the National Book Award. His most recent book, Abigail Adams (2009), received the Bancroft Prize. Wow, you never would believe how after so much teamwork amongst women, blacks, and Native Americans, they still were discriminated against by whites. The amount of contradiction within the ideals of our founding fathers is immensely disturbing.